Acromove’s new ServerPack35 efficiently moves up to 144TB between facilities, combines compute, storage, and networking in a unique Hyper-Converged Appliance that is software-agnostic. Acromove manufactures portable NAS and RAID computer systems, one of only a few companies innovating in the hardware space. When you first see an Acromove product you notice immediately that it is built for the way you always wanted to work, unbound from massive racks of equipment but with the advanced capabilities you need for the modern era of computing, including the Industrial IoT. Acromove’s products are true inventions informed by experience and crafted with art. They will be showcasing at IoTTech Expo Santa Clara 2018 in booth #620. Cyber Security, Big Data, Cloud and Oil & Gas companies create, store, and move a ton of data every day. Media libraries, archives, data centers and company resources – it adds up quickly. Getting this data to the cloud or between facilities can be a real time-waster. Moving 1TB of data to the cloud with a high-speed 100Gb Ethernet pipeline and file transfer acceleration software such as Aspera will take about 24 hours. If you have 50TB to move it will take over 50 days. There’s no economy of scale, it’s all based on math. This is a best-case scenario that is rarely available. The Acromove ServerPack 35 makes it possible to store and move 144TB (120TB with RAID 6) of data in about one week – a day and a half to copy onto the drives, 2 days for UPS/FedEx, day and a half to upload to the cloud server directly. This “sneaker-net” is an old tried-and-true method but with today’s huge datasets it requires the sophisticated technology that Acromove packs into its products to make things work efficiently. ServerPack 35 is a unique portable NAS using an 8-core Xeon processor (optional 16-core) with up to 144TB raw storage (120TB with RAID6). It includes GbE and 10GbE copper and can be outfitted with 10GbE SFP+ and 40GbE QSFP+ network connections. 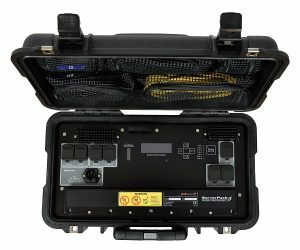 All internal components are shock-mounted and the Pelican case it comes in is IP67-rated for water and dust protection. Stored data is protected with AES-256 encryption and the enclosure is tamper-resistant. The system is sized to ship as airline luggage for economy and weighs about 65 pounds with disks for inexpensive shipping. Acromove has partnered with Seagate to offer the latest helium-filled Barracuda Pro 12TB 3.5” drives for the largest capacity in a 12-bay NAS. Acromove has tested this new drive extensively to deliver optimal performance throughout its storage range, achieving about 1600 MB/s with its large internal 256MB cache and dual 10GbE connections. ServerPack 35 can be configured with any operating system and software required by the end-user. The first major client of this system installed Ubuntu Linux and OSNEXUS QuantaStor Migration Edition for a ZFS-based mass data transfer appliance. Another interesting workflow can be set up with Hortonworks HDF (Hortonworks Data Flow) for data ingestion in an IIoT scenario. Big data ingestion is about moving data – especially unstructured data – from where it is originated, into a system where it can be stored and analyzed such as Hadoop. The ServerPack 35 can serve as an Edge Computing device, collecting and processing information before moving it to the cloud. More information is available at their web site https://acromove.com and on Facebook, Twitter, Instagram and LinkedIn.